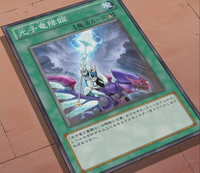 Main card page: "Luminous Dragon Ritual"
This card is used to Ritual Summon "Paladin of Photon Dragon". You must also Tribute monsters from your hand or field whose total Levels equal 4 or more. This page was last edited on 1 June 2015, at 11:41.